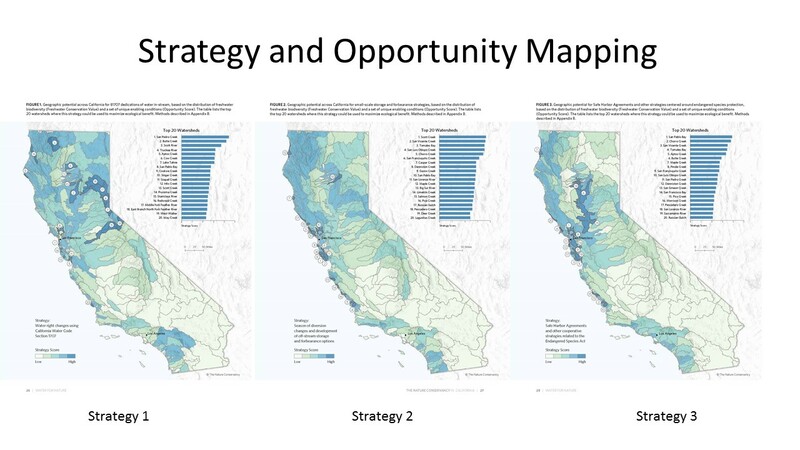 Strategy and opportunity mapping defines the potential spatial extent of different candidate strategies, and evaluates the contribution of each strategy toward conservation goals, and informing the selection of which strategies to implement. Strategy and opportunity mapping also aids the implementation of selected strategies by identifying where each strategy can most effectively be implemented. By creating maps that show what you expect to happen under each candidate strategy and what would happen if you did nothing, you can compare outcomes and create a spatial analysis of the impact of your proposed strategy. These maps can be powerful tools for informing the selection of which strategies to implement, and for showing where each strategy can most effectively be implemented. Articulate and document assumptions required for mapping. For each strategy, there are assumptions about what changes the strategy will make, and these need to be specified. For example, you might have a strategy that aims to increase adoption of agricultural best management practices. To map the potential area where that strategy could work, you may need to further specify which kinds of agricultural lands you think the strategy will affect (e.g. row crops, specialty crops, ranchlands). Or you may have identified a minimum goal related to improving conditions for vulnerable communities. You may now need to specify how you are defining vulnerable communities (e.g. those classified by the US Census as below the poverty line, a specific First Nations group or indigenous tribe, people living within 5 km of the coast). Many of these assumptions will already be in the result chains (especially if you did them well! ), but, often, additional assumptions are required to turn the results chain into a strategy map. 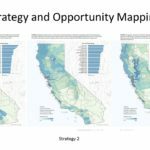 The Nature Conservancy in California conducted a thorough strategy analysis for environmental freshwater flows. This is a good example of strategy and opportunity mapping and it can be useful as a reference throughout this section. Follow this link, Water for Nature, for the full publication documenting the process used and products generated, including full size versions of these maps. 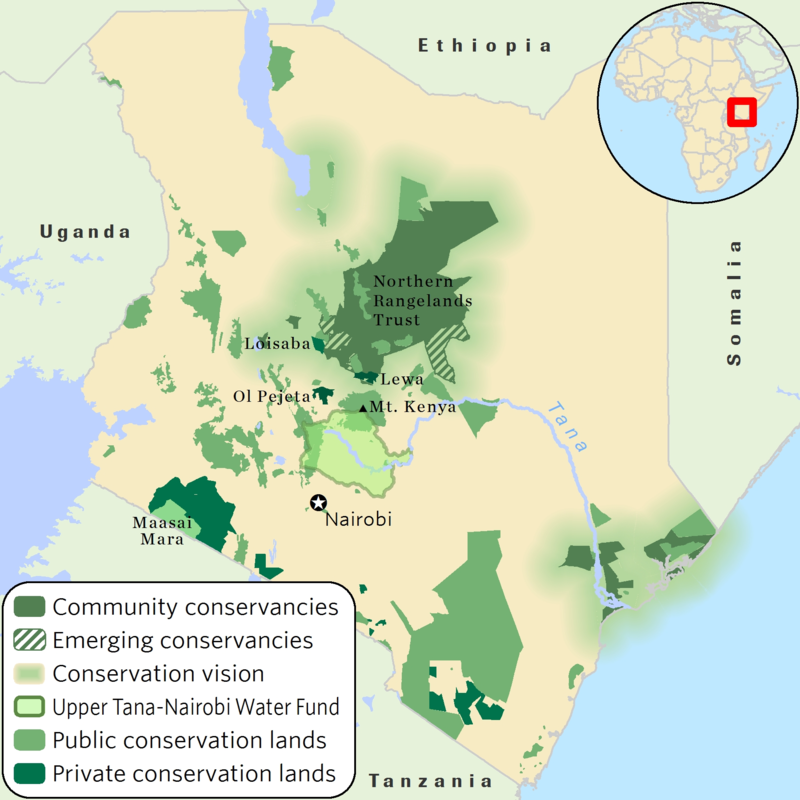 Map expected status of conservation and human goals without any strategies. The purpose of this step is to paint a picture of how the world would look if you did nothing. Too often, conservation targets and other primary interests are in decline. In these cases, a conservation strategy could be considered successful even if it only maintains current conditions as they are today. The most relevant comparison for understanding the benefit of a conservation strategy is in comparison with a "do nothing" world. In some contexts, this is referred to as a 'baseline scenario' or 'business as usual' abbreviated as BAU. Map the expected future distribution and status of each conservation (e.g. fish species diversity by river reach) and human well-being interest (e.g. drinking water quality, fire frequency near residential areas, air pollution in high population density areas) identified in your minimum goal statement. Also map the status of any elements identified in your results chains as potential risks (e.g. non-target species that may be negatively affected by restoration, low income neighborhoods that may be negatively affected by altered access to an urban park, non-engaged indigenous communities that may be harmed by engagement with other indigenous communities). This map(s) should be forward looking over the period of time you have identified in the scoping phase (e.g. if your minimum goals were set for a 5 year time horizon, this map should reflect how you think conditions will look in 5 years). Projections of some useful information may be for longer time periods, so you may choose to use a longer time frame for this analysis. 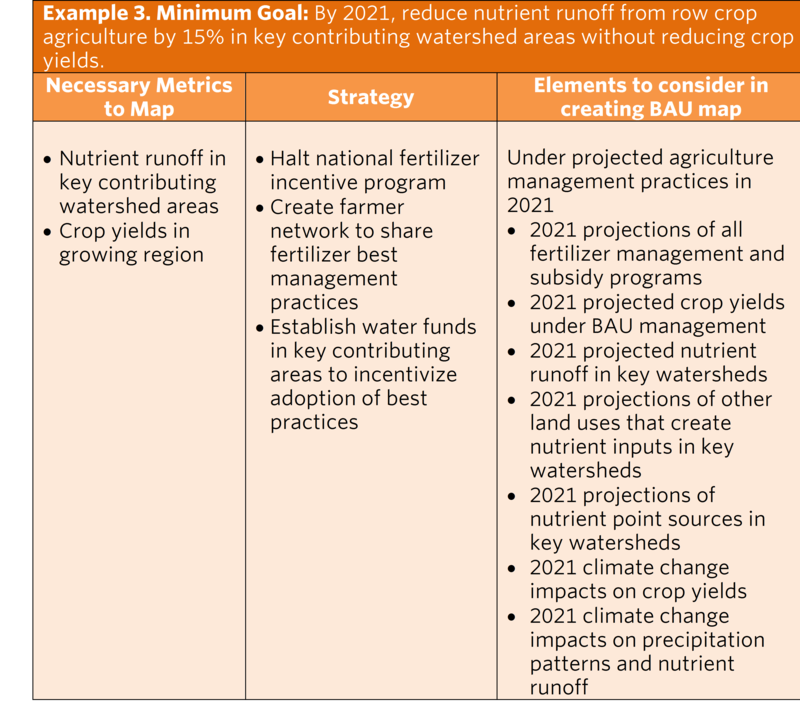 But please note, you must use the same time frame for all data sets and all maps in this step of Cbd 2.0 (strategy and opportunity mapping) and have a means to adjust the impacts you estimate back to the timeframe of your minimum goal statement. Consider the following three illustrative examples of minimum goal statements, and relevant elements that might be included to create 'business as usual' maps for them. 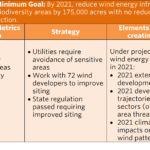 To create a business as usual map (Figure 11), the team did an overlay exercise, asking where projected wind development is likely to occur if no new strategy is advanced, and where that development intersects with sensitive habitat areas. 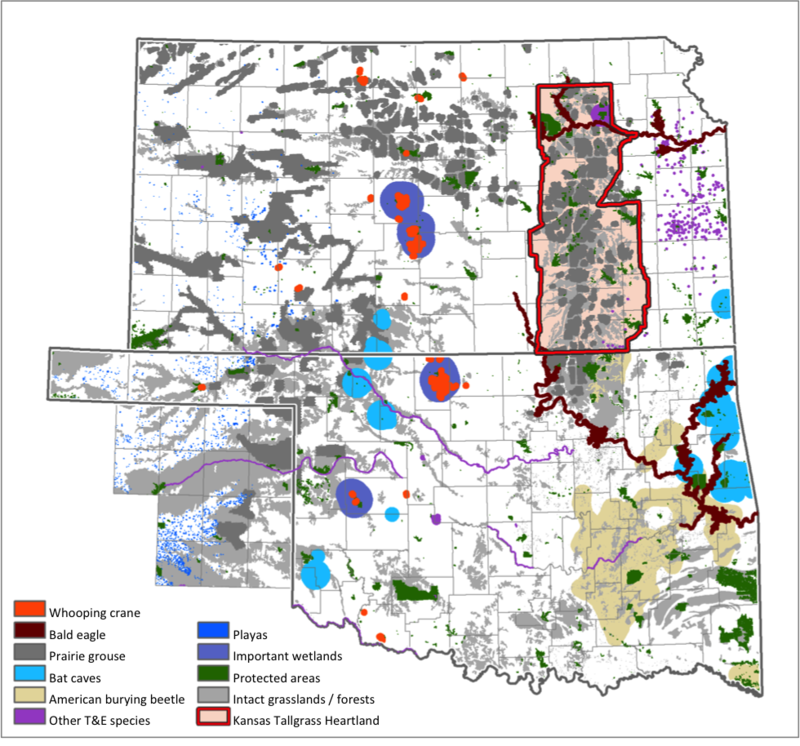 Ecologically sensitive areas were mapped for the study region (Oklahoma, Kansas, and a small portion of Texas). These included threatened and endangered species, species at particular risk from wind development (bats), rare habitat, and the most intact examples of 'matrix' habitat (grasslands). 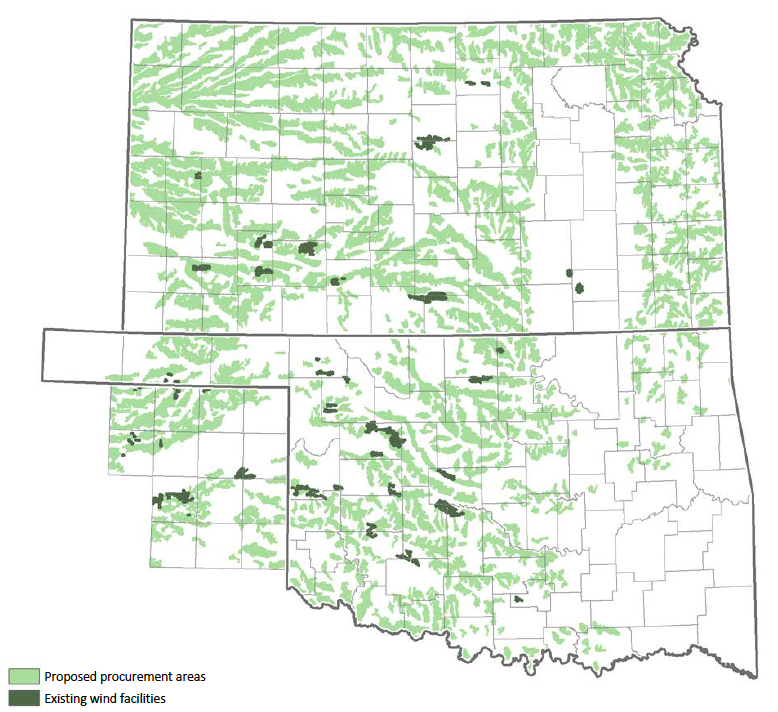 These are areas where wind development would compromise conservation goals through direct mortality of species, or impacts to habitat due to both direct habitat destruction and fragmentation and indirect effects such as species avoiding suitable habitat due to disturbance caused by energy development. Projections of future conditions should include consideration of climate change impacts. Document all data used in the mapping process, including scale, time period, level of certainty, any cutoffs or thresholds used and any other relevant information. In the case of more complex datasets (e.g. connectivity maps, species distribution models, vegetation index maps, etc.) the methodology used should be cited or described. Many existing or feasible analyses can be helpful in this step including climate change projections, biodiversity threats analyses, existing sensitive species viability analyses, human population growth and migration projections, land use change projections, maps of sold or committed natural resource extraction permits or concessions, sector development plans or projections (e.g. energy sector expansion plans, transportation infrastructure plans, urban plans, agriculture sector plans or conversion projections) or other development plans or projections. Map potential extent of each candidate strategy, considering its enabling conditions and intermediate results. This step identifies where each strategy can touch down in space and have the potential to meet the minimum goal(s). Creating this map can be aided by walking through the results chain for the strategy and asking what impact the intermediate steps are likely to have on the spatial footprint of key determinants of the strategy's impact. It may be as simple as mapping the political boundaries of an area that can be affected by a policy strategy. For example, consider a strategy that aims to reduce water use rates in a 10 county area by introducing a new graded water use fee that increases with water consumption volume. The new water use rates would affect all residents in the 10-county area, so the strategy map may simply show the 10 county boundaries. Or consider two different marketing strategies aimed at the same goal in the same state--getting in-stream environmental flows requirements set for the three largest reservoir/hydropower complexes. One strategy aims to increase voter turnout for the initiative through an advertising campaign targeted at recreational river users including high revenue kayaking and river rafting communities as well as city dwellers who visit the river to swim on weekends. A second campaign strategy would focus on gaining support from the business community, using hydropower industry spokespeople to reveal the positive aspects of the initiative for local businesses. Assume that recreational river users reside in the state's four largest cities, so the recreational campaign will be targeted to all the voting districts associated with these cities. Those voting districts become the strategy map. The business community is centered in three of the four largest cities, and in one additional mid-size city near one of the big hydropower facilities. The voting districts associated with these cities become the strategy map for this alternative strategy. The strategy of improved grazing in community conservancies applies to a broad area of pastoralist communities in Northern Kenya (Figure 13). Rangeland within existing and emerging conservancies covers 10 million acres. The long term conservation vision is to expand to other applicable areas, which could more than double the acreage benefitted by this strategy. As this example illustrates, strategy mapping need not be complicated. Even simple maps of anticipated geographic extent of a project are important because they facilitate the ability of stakeholders to weigh in on how a strategy may be affected by politics, climate, or other variables and to have a shared understanding of how large the impact of a strategy could be. For strategies that aim to find efficient spatial solutions for multiple goals, the process may be more complex. 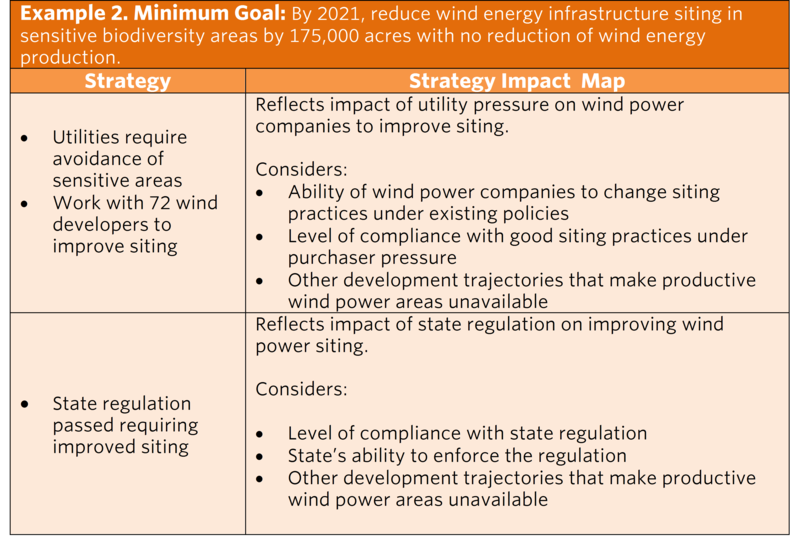 For example, in the wind energy example we have been using, consider the strategy to engage utilities in driving better wind infrastructure siting. In the first step of the results chain, utilities only purchase from providers doing good siting. Which producers do the utilities purchase from and where are they likely to expand wind infrastructure? These are the areas in which we can expect improved siting if the strategy works. Then the chain notes that fewer permitting problems speed wind development. How much will the potential wind footprint grow because of this? If all this wind development is well sited, where will it be placed? Answering these questions will identify the potential wind footprint and the areas avoided. These questions could be answered simply by using existing projections or systematically collected expert opinion and local knowledge, and overlaying relevant data sets. 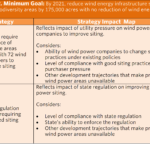 Alternatively, they may be answered through complex modeling that includes spatial optimization of data identifying relative importance of many sensitive areas, energy generation potential, distance to transmission infrastructure and other factors that make wind development more or less profitable. Having completed its business as usual maps as shown in the example above, the Central Great Plains team then mapped how proposed wind facilities overlap with sensitive habitat areas. 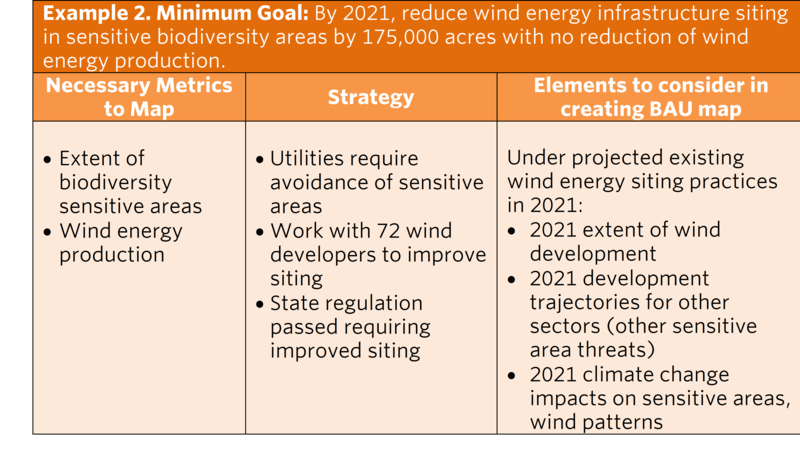 Analysis of proposed facilities (FAA 2015) indicates that 28% of anticipated wind development will occur in sensitive areas under business as usual. 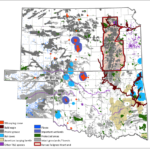 Based on projections of 10.4 GW of additional wind development in Oklahoma and Kansas by 2040 (USDOE 2015), this strategy could result in 235,866 acres of avoided development in sensitive areas. When mapping strategies, consider incorporating local knowledge. 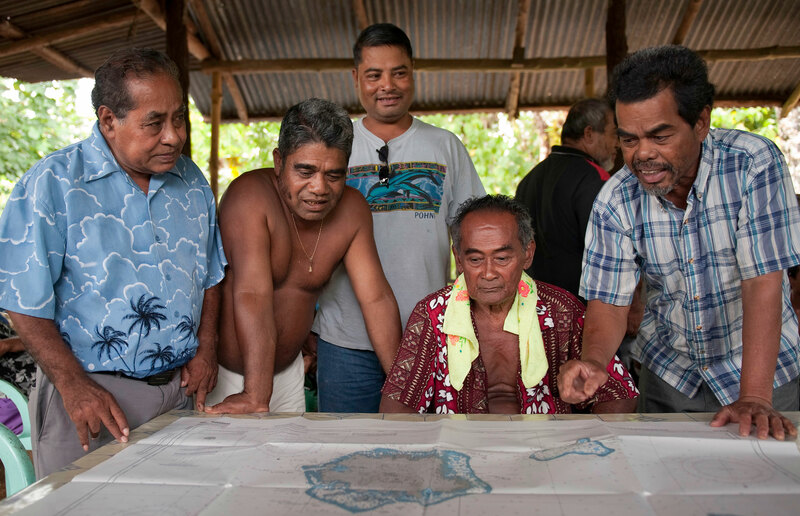 When mapping strategies, consider incorporating local knowledge, such as indigenous and traditional communities' knowledge, key stakeholders such as low-income communities in cities, farmer networks in rural areas, fisher cooperatives or communities and others that have advanced knowledge about the landscape or seascape and their spatial interpretation of the landscape (e.g. SIGAP in Indonesia) as deemed permissible and appropriate by these communities or groups. Use tools and techniques that are participatory and easily understood, such as 3D participatory mapping. As much as possible, create maps where the information is not only presence or absence. Several results will not have a simple yes/no distribution, but can be based on the probability of occurrence or be described in terms of magnitude, density, etc. The more information included in relevant data layers, the more useful it will be for spatial targeting. Design maps with updates in mind. It is useful to design your strategy map so that, once project implementation begins, it can be updated to reflect success (or lack thereof) in implementing intermediate steps. Refine potential extent of each strategy to reflect organizational resources and capacity. While a strategy may have the potential to affect a large amount of space or a large number of people, the organization may have limited capacity and resources to pursue it. At this stage, these considerations should be bought into play so that the impact estimated for each strategy accurately affects the program's ability to implement the strategy. If, for example, a strategy could affect multiple political units (e.g. counties or countries) but the organization only has well established and necessary political relationships in one political unit, the strategy map should be adjusted to represent that one unit. Or if a strategy could lead to adoption of a management practice by all people in a large area engaged in the practice, but we only have capacity to drive engagement in half of the population, the map should be adjusted accordingly. Include the resources and capacity of partners. Many strategies have a leverage element or in some way explicitly include the engagement of other organizations or actors. If there are ample resources and capacity to be effective in that strategy element, then this step should consider the likely capacity and resources of partners or other actors as well. For example, if a corporate engagement strategy aims to influence a company's sourcing activities, the current or projected footprint of their supply chain should be mapped, not just the location of the one or two offices we may be working directly with. The assumption is that if the strategy works, the company will apply new practices to all of its supply chain, so that is the spatial extent of the potential strategy impact. You can find a partner capacity scoping database template, as well as other partnering tools and templates, at the Conservation Partnership Center here. Create multiple maps if there is a lot of uncertainty in this step. If there are key uncertainties that limit your ability to make a good estimate of how your capacity and resources will affect the extent of strategy impact, then create alternative maps that capture different versions of the area of uncertainty. For example, if there is a policy strategy that requires support from the ruling party, but there is a major election due 6 months into strategy implementation and we have stronger relationships with one party than the other, it may be difficult to represent how our capacity will affect strategy scope. In this case, you might create one map for the case when one party wins the election, and another map for the case where the other party wins. You could then see in the next step how much the outcome of the election would influence the strategy's overall impact, and decide if the risk was acceptable. Seek peer, stakeholder, and expert review. This is a useful stage to share strategy maps (or the logic behind them) with key stakeholders and external experts to ensure you have accurately reflected the potential spatial extent of strategies. Stakeholders and holders of local and traditional knowledge often have critical information about where a strategy can or cannot be effectively deployed. For example, in an early Latin American water fund case, strategy maps were created and shared with stakeholders in the target watersheds. They noted that several key areas the team had identified as potential strategy areas were in active conflict zones, so not available for application of the strategy. The team was able to update the maps and provide more accurate information for later steps in the process. 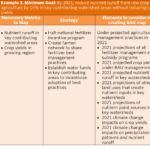 Map and quantify expected changes in status of conservation and human well-being goals with each strategy. Combine the information compiled in the previous steps on assumptions about the impacts of the strategy on the same minimum goal metrics mapped in the "no strategy" (baseline, business as usual) maps. The previous step established where each strategy could touch down. This step calculates how much impact the strategy will have if enacted in those places. The timeframe used here for estimating change must be the same as that used for the business as usual/no strategy maps created previously. Creating these maps can be a simple overlay process where you ask how much the strategy extent maps (mapped in the previous step) overlap with conservation goals (e.g. habitat to be protected) and people we intend to benefit. Alternatively, this can be as complicated as modeling non-linear responses of conservation targets to drivers, modeling multiple conservation, ecosystem service and social benefit flows, or exploring multiple climate scenarios to clearly reflect the range of possible benefits from the strategy for both nature and people. Potential negative impacts of each strategy should also be estimated at this stage. If the results chains identified unintentional negative outcomes for other conservation elements or for people, these impacts should be quantified so strategies can be compared both on their strengths and their weaknesses. Consider again two of our three examples of minimum goal statements from above, now with the relevant elements that might be included to create strategy impact maps for each strategy. In general, conservation investments should be targeted toward areas that are more likely to be resilient to climate change, while remaining representative of the range of landscape features (e.g. geology, soils, topography) necessary to protect the full suite of current and future biodiversity. Investments in areas whose conservation values are expected to be significantly eroded by climate change (e.g. purchasing lands expected to be submerged by rising sea level) should generally be avoided. If they are chosen, they require additional justification (e.g. 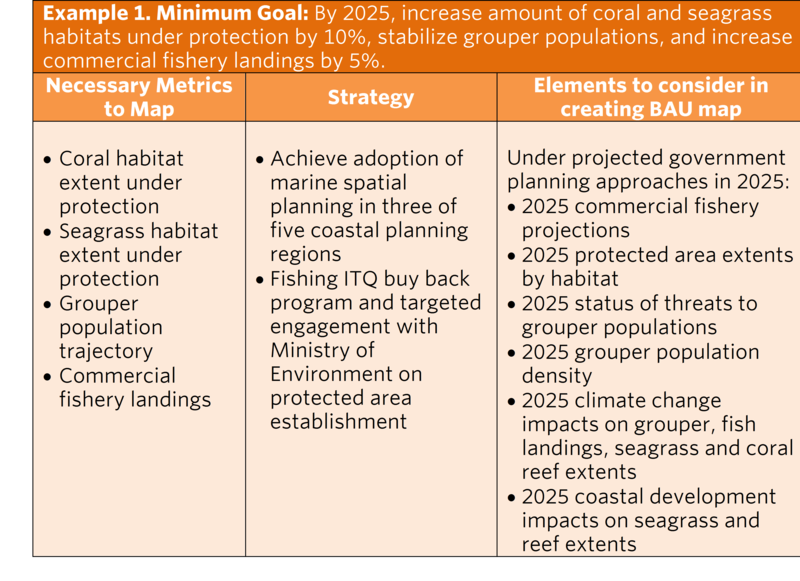 a viable plan for inland migration of coastal habitat). 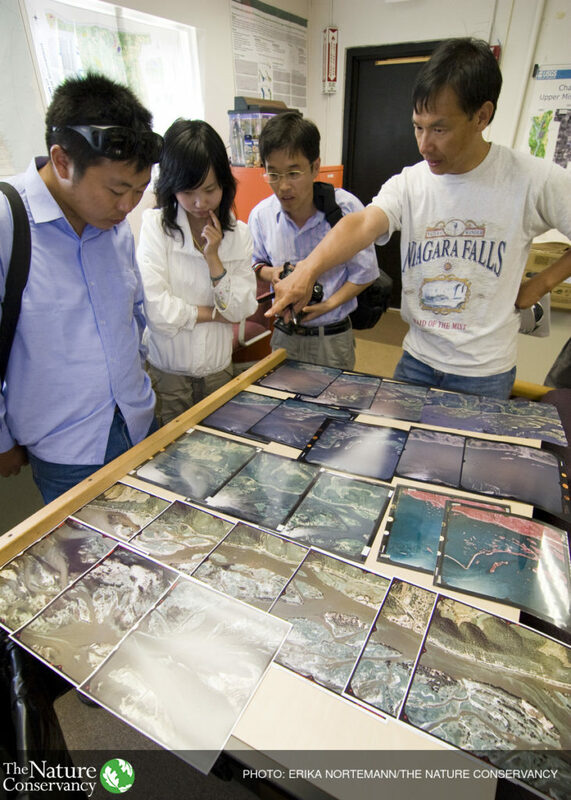 Tools such as those provided by the Reef Resilience and Coastal Resilience networks provide guidance and resources to help managers and decision makers address the impacts of climate change, and Conserving Nature’s Stage suggests an approach for identifying resilient and representative areas, designed to be applied at the scale of regional conservation planning. Reconsider and map both positive co-benefits and negative impacts on people. 1. Will the strategy help mitigate or adapt to climate change, or worsen emissions or resilience in some way? 2. 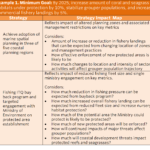 Are there provisioning ecosystem services that may be affected, like hunting, fishing, ranching or harvesting areas that will have greater or limited access because of the strategy? 3. Will water quality or supply be improved or limited for key uses like drinking water, irrigation, industrial use, energy production, transportation or recreational use? 4. Will the strategy disproportionately impact or benefit vulnerable or under-represented groups of people? 5. Will access to or condition of culturally important sites be improved or harmed in any way? If risks are identified, what should you do? If risks are identified, determine if it is possible to adjust the strategy or mitigate these risks, and if so, develop a plan on how this might be achieved. In the case of indigenous peoples and other vulnerable communities that might be impacted, adjustments should be developed via a participatory process where these stakeholders are made aware of the potential for harm. Consider optimization methods when strategies are highly dependent on spatial context. Optimization methods can be beneficial when there are spatial dependencies, such that the selection of one place influences the value of including other areas. Optimization may also be useful when a conservation project has multiple goals and there are tradeoffs among the goals. Multiple-objective spatial planning is a rapidly evolving field, with approaches that vary widely in their complexity. Marxan, Consnet, and Zonation have been used successfully in conservation contexts. If a strategy is likely to have costs that also vary spatially, you may want to include this cost information (see step 6 below) before running an optimization. Estimate costs, calculate return on investment. For strategy selection, the 'conservation return on investment' of a strategy (hereafter ROI) is an important consideration. The conservation ROI estimates the conservation benefit per dollar invested (not to be confused with the conventional definition of ROI as an estimate of financial returns). An estimate of costs is necessary to calculate ROI. Estimate the costs of implementing each strategy, and then calculate ROI by dividing the benefits estimated in the previous step by the strategy's cost. These ROI estimates will be used in the next CbD 2.0 step – Strategy Selection. When there is a simple minimum goal statement with only one clear element, divide the estimated strategy impact on the metric for that element by the strategy cost. 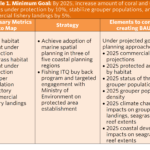 If there is more than one element in the minimum goal statement (as in the marine example above), calculate an ROI for each impact metric by dividing each impact metric by the total strategy cost. 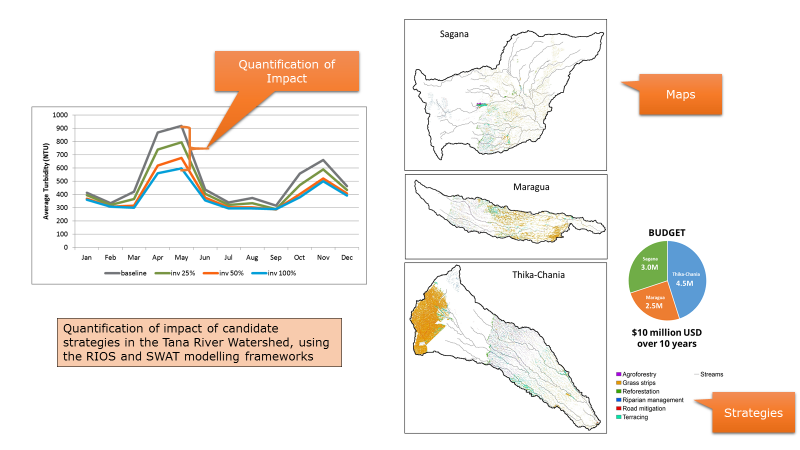 To identify water fund strategy options in the Tana Watershed, which provides 95 percent of Nairobi’s water, spatial analysts used investment planning and watershed modelling tools to assess the effectiveness of candidate strategies, including their economic impact on key stakeholder groups, as illustrated below. You can see the full process and products of this analysis in the Upper Tana Nairobi Water Fund Business Case. Consider whether costs vary spatially. Several costs can vary spatially and this can affect how and where a strategy is best deployed (considered in the previous step) and how we interpret ROI. For example, if high conservation impacts are expected in areas with low costs, we will see a higher overall ROI than if high conservation impacts occur in areas with high costs. Calculate just your project costs. Don’t include societal costs, or the costs to partners. The cost estimates are designed to allow you to calculate ROI, which should reflect return on investment from your organization or team, independent of other funds that may be leveraged. Consider costs of relevant non-conservation alternatives. For strategies that depend upon convincing others to invest in conservation rather than a traditional, non-conservation alternative, it may be useful to calculate ROI for competing, non-conservation alternatives (e.g. grey infrastructure vs natural infrastructure). 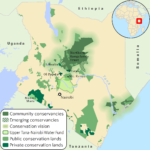 Maps that identify where the conservation strategy is the economically preferred alternative can be very influential. Consider costs of monitoring and evaluation. Although the costs of monitoring will not be fully quantified until the monitoring and evaluation plan is developed, it is useful to estimate monitoring costs for inclusion in calculating ROI. Consider monitoring and evaluation required for adaptive management, risk mitigation, regulatory compliance, and influencing others. Did you document the assumptions, sources and methodologies used in the process to map your strategies? Does your analysis allow quantitative comparison of each strategy’s impact on metrics of the elements in your minimum goal statement relative to the impacts of a ‘business as usual’ projection? Do stakeholders and external experts understand and generally agree with your impact estimates? 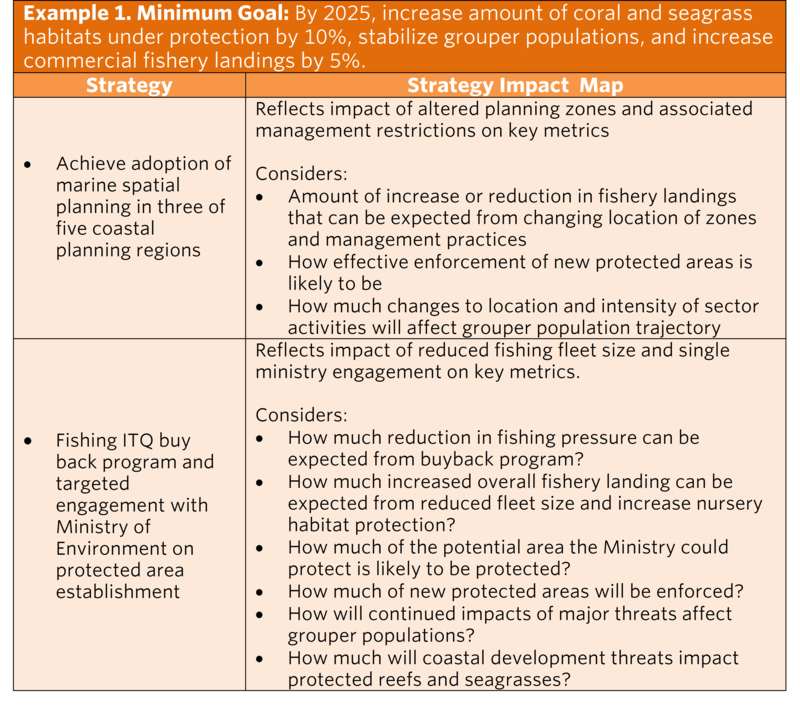 If a strategy is pursued, will your analysis inform where to target implementation and where tangible conservation outcomes are expected to be achieved? Do cost estimates allow comparison of the conservation ROI of alternative strategies? Have you included the costs of monitoring and evaluation? Have the anticipated benefits of a strategy to people been quantified in a way that is relevant and defensible for stakeholders?